Acropats - the kid's toy that grows with your child! A good friend of mine has turned the patent he invented into a fantastic creative toy called 'Acropats'. My daughter has had the prototypes for Acropats for a couple of years and really loves them. They're one of those amazing creations that grows with your child. Not just as the creators friend, but as someone who encourages innovation and creativity I heartily recommend you buy a child a set of Acropats! It has been fascinating seeing how my girl's interaction with these toys has developed as she has grown up. When she was tiny she enjoyed the tactile nature of Acropats, as her motor skills improved she was able to start linking the figures together. 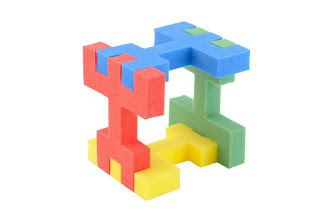 As my daughter's creative side blossomed Acropats became a construction toy. I love seeing what she's going to build next. Since getting our set of Acropats they have always been 'in play' in some way. I very much recommend buying a set. The price is a lot more reasonable than a lot of other toys and they've lasted a LOT longer than some of the 'big brand' toys that have been bought for my girl. This morning's father / daughter skatepark adventure lasted 11 seconds. We arrived at Felixstowe skatepark with the place to ourselves, she promptly fell off her scooter and landed on a bit of glass that cut the palm of her hand. We cleaned up in the baby changing room at Morrisons but mutually agreed to abandon play. Although the cut on my girl's hand was clean it was bleeding pretty well. My daughter and I have been waiting for what seems like a long time for the rain to clear,and the ground to dry out so we could go skate, so we were both a bit gutted that the careless stupidity of someone else stopped us. The last time I skated at Felixstowe I spent an age clearing up bits of glass and other detritus, I think I might take a broom with me next time and do everyone a favour but having a whip around the place. And that right there is one of those moments when I realise I'm both an adult and a parent. I'm back from a skate session and talking about my desire to do civic housework, rather than talking about the rad moves I busted on my board. This might also be because RAD moves aren't really my forte. My girl is fine. She's very much the type of child that doesn't let a little thing like minor injuries in the pursuit of fun put her off anything. One of the personality traits she has inherited from me. One that I admire, but does trouble me a bit. All things considered Felixstowe skatepark is still my favourite skatepark (so far). 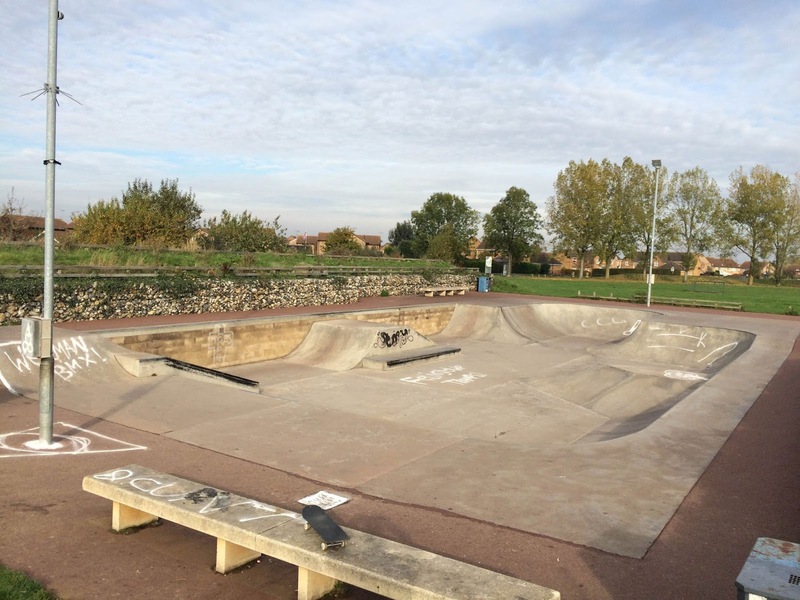 We're yet to visit the skateparks in Stowmarket, Hadleigh, Bury St Edmunds or Woodbridge but the layout of the Felixstowe skate park is going to take some beating. 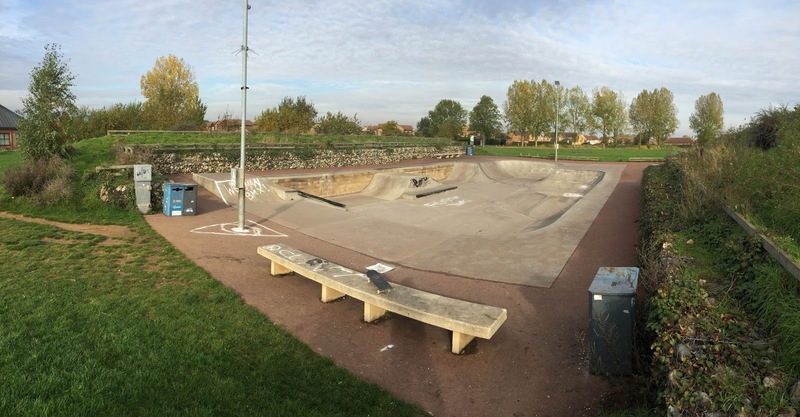 Felixstowe Skatepark - albeit with some profane graffiti photoshopped out. Annoying phone calls are something that have been troubling the UK public for almost as long as we have had phones in our homes. For the time being most unwanted phonecalls come through our landlines, and don't (as yet) affect our mobile phones. Part of the reason for this might be that blocking and rejecting calls on cellphones is quite easy; all smartphones either have a call blocker built in or a free call blocker app is easy enough to find and install. broadband Internet users I don't need a phoneline to get an Internet connection - I'm with VirginMedia so my connection is via a co-axial cable. So the problem I have is that I need to have a landline, but the only calls I ever got on my landline were unwanted calls. PPI calls, surveys, accident claims, funeral planning, double-glazing, home-improvements, pensions you name it, I'd get the annoying calls about it. I couldn't just ignore my phone as there's still the potential that new clients might find my phone number and give me a call on my landline as a first point of contact. Some days I would get ten or fifteen spam phonecalls a day. I'm a polite person by nature, and I realise that I could have just hung up on these callers as soon as they revealed their purpose, but I don't believe anyone deserves to be spoken to disrespectfully just because of the job they do. I have registered my phone number with the TPS (telephone preference service) several times but it appears to make no difference at all. In theory registering with this free service should stop unwanted spam calls, but appears to be entirely futile. When I first registered with TPS I would tell callers that in theory they shouldn't be calling me they would quite often get the hump with me and tell me they don't check to see if numbers are registered with TPS. The only way I could think to stop nuisance calls would be to block the numbers the calls were coming from. Unfortunately VirginMedia don't offer a call-blocking facility. So each time I got an annoying call I entered the callers' number into the phonebook on my phone, represented by a profanity. Having swear words pop up on our phone was amusing for a bit, and it at least let me know which calls I could ignore, but it didn't stop the basic problem. When the phone rang I still have to stop work, get out of my seat and wander over to the phone. One day the same caller rang me many times and I decided the only option I had was either to cancel my phoneline entirely or to find a better way to block calls. In reality I can't cancel my phone service because my company's phone number is listed in a lot of places and I don't want anyone thinking I'm no longer in business. As already mentioned there are many call blocker options on the market, but many do not have a display screen and many are expensive and appear to be complex to set up. I wanted a solution that was truly 'fit and forget'. The Call Saint Nuisance Call Blocker needed no set up and worked straight out of the box. I decided to set up the date function but to be honest there's really no need (as far as I can tell). You just plug your phone line into the back of the neat little box and then (using the supplied leads) connect your existing phone to the back of the call blocker. It doesn't even need to be plugged into the mains! The Call Saint has hundreds of UK call centres programmed into it right out of the box, so from day one almost all of the unwanted spam calls stopped. If I get an unwanted call I press the * key on my phone and the call blocker automatically adds the number to the blocked list. This really is the easiest way to stop annoying phone calls. If you're stood near the call blocker when you take an unwanted call you can click the nice red 'BLACKLIST' button, it's surprisingly satisfying. When you receive a call from an unwanted caller the call blocker stops your phone from ringing. So while in theory you're still receiving the call in reality you're completely unaware of it. Ignorance is most definitely bliss. 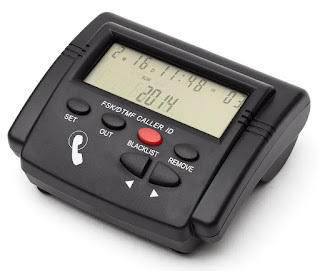 There's really not much else I can write as a review - the call blocker is incredibly easy to set up and is very effective at stopping spam calls, while ensuring calls you actually want still get through. While this device is brilliant at stopping most UK call centres straight out of the box it won't stop calls from callers who withhold their numbers. There is an option to block withheld (and overseas) numbers but there are callers you may need to hear from who legitimately withhold their numbers (like Doctors' surgeries) and some older office phone systems don't have the ability to 'pass' their number to your phone, so if you block all number withheld numbers you may be missing out on some genuine calls. That being said, the Call Saint Call Blocker is incredibly effective from the moment you plug it in. Apart from setting the time and date on the display I've not touched any of the call blocker settings. I have added a few numbers to the blacklist but not many, because there haven't been many calls that have gotten through to me! This call blocker will work with any phone provider and is compatible, but you will need caller ID activated. Get GRAZE snack boxes for free! In this blog post I'll reveal how to get free Graze boxes without having to use any dodgy discount / voucher code websites! Graze boxes - what are they? If you work in an office in the UK there's a very good chance you already know the answer to that question. 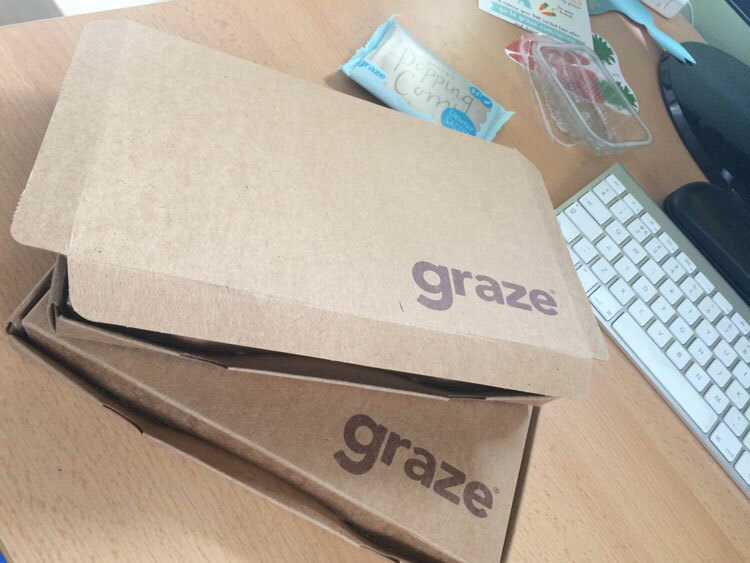 Graze snack boxes aren't so much a craze as they are a standard part of office equipment. If you work in a large office complex and you'll spot desks that not only have the standard computer monitor, pens, bottles of water but also have a Graze box like the one shown on this post. Actually the snack boxes you'll see will probably be VERY much like the one shown at the top of this post, which is empty! But if you don't work in an office then you might not have heard of Graze before. Graze is a service that sends you boxes of snacks through the post. Each snack box contains four pods, each pod has a different snack, each snack is healthy, fresh and good for you. Because they're impressively creative and tasty! Well obviously there's more to the 'Graze craze' than taste, no matter how nice these snacks are there's some really neat technology behind the organisation that keeps the company as a serious contender in the crowded snack market. First of all there's the clever marketing, anyone who receives Graze boxes can 'gift' a free box to anyone using vouchers. Every loves free, but also everyone loves being seen as a trendsetter. One free snack box discount code between friends can quickly spread the Graze brand from one company department to the next, and ultimately from one company to the next. 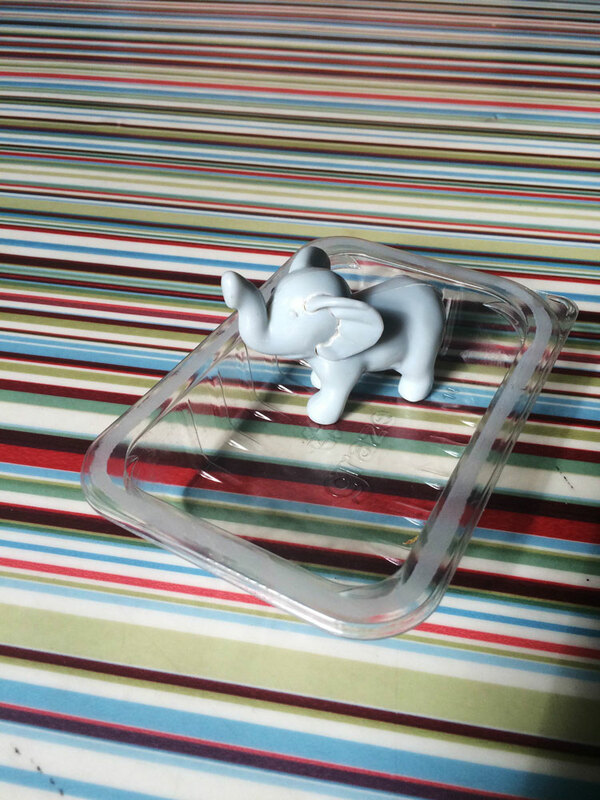 According to my daughter empty Graze pods also make good boats for Elephants. 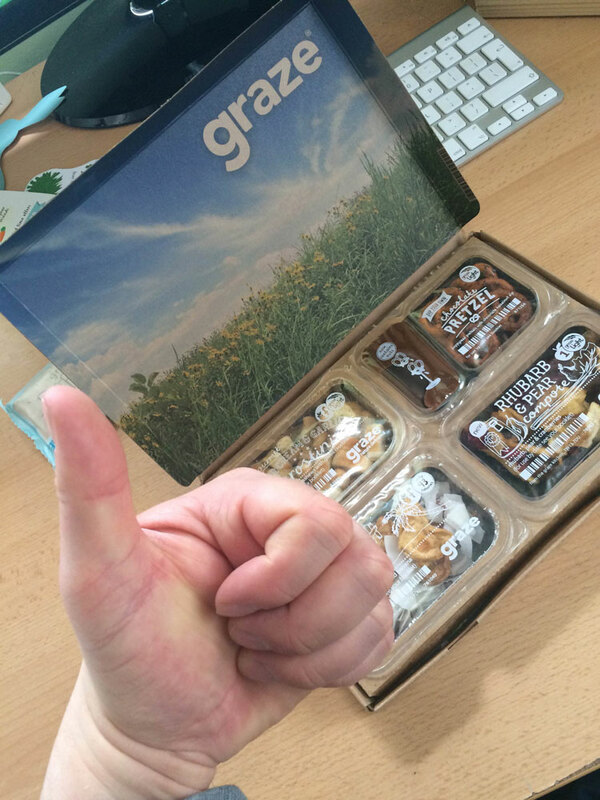 When Graze box recipients visit the Graze website they are given the opportunity to rate the snacks they have received. The more you rate, the more focussed on your tastes the snackboxes you receive will become. I'm not sure how many people actually make the effort to rate their boxes. I get at least one snackbox a week and it's pretty rare that I get sent a snack I wouldn't wish to receive again. The reason I have no cause to complain is that the creativity behind the food creations that arrive in these boxes. Rather than choosing the 'standard' box I joined the 'light' menu - despite the fact all the snacks I receive are below an impressively low calorie threshold there are none that are bland. Like a lot of blokes I'm not really watching my weight, but knowing that I can gorge on everything that arrives from Graze without worrying about needing to buy larger trousers is a good feeling. I work at home a lot of the time, and food is an important part of my day. When you work at home there are very few events during a day to break up your day - if you work in an office people come and go, jokes are told, woes are shared. Life is all around you. Homeworkers do not get this. So I welcome any surprises that can help break up my day, and opening my Graze box each week is a very pleasant surprise indeed. In summary, if you like food like the idea of tasty snacks dropping through your letterbox (or being placed on your desk by the office mailman) then click the link below to get a free box. There are other sites who give away voucher codes and discount coupons for Graze boxes, but by getting your freebie by clicking the link here on my blog you'll be saving yourself the hassle of giving away any of your personal details to any of those voucher sites. You'll also be helping me get a free lunch, and for that I'll always be grateful! P.S the special offer for free snackboxes changes occasionally, so you might actually get more than one box for free!